Putt Better Today. But Be Prepared for Ridicule! If putting is driving you crazy maybe all you need to do is see better. When you are behind the ball looking for the line and assessing speed your brain is doing that “hand-eye” coordination thing. Then you set up to the ball and everything changes. You go from looking at your line with binocular vision (both eyes) to monocular vision (one eye). Isn’t looking with both eyes better than using just one eye? Isn’t the idea of putting about rolling the ball on your intended line? If these two points are indeed true, why is everybody standing parallel to the intended line? Wouldn’t it be better to stand open to the line so you can see with both eyes? Makes sense to me. All of this begs the question: If being open to the line – even as much as 90 degrees, makes sense, how come nobody in professional golf uses that style? Well, K.J. Choi does, or at least he was in 2010. Why more players don’t putt this way is as common a rabbit-hole dialogue as anything else in golf. I think it mostly has to do with conformity. Committed non-conformity requires a massive amount of confidence. You can’t care what people think or be worried about what will be said about you. For professional golfers it is not possible to avoid the spotlight when they do something “different.” It is the rare player indeed who can pull off something they know is effective but considered radical. I’m not suggesting that everyone use this technique but I am suggesting that you open yourself to the line so you can see better and use your right arm and palm more effectively. How much open that is will be a matter of preference. You can usually figure it simply by opening until see better and go from there. 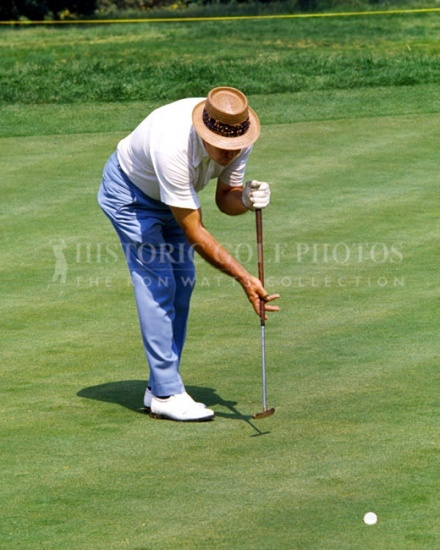 It has always made sense to me that using your right arm and palm to push the ball onto your intended line is the best way to putt. If you are a right handed player, it is illogical to circumvent your natural handedness by focusing on your left wrist and making it the guiding principle that produces control. Rule 16-1e is there for a reason. It’s just to easy to roll the ball on the intended line if you straddle the line!